… particularly for Junior/YA Readers, I realised that — of course (duh!) 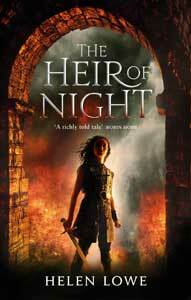 — Thornspell is also Arthurian-influenced Fantasy. It’s not the main focus of the story, which is a retelling of the Sleeping Beauty fairytale from the perspective of the prince, but I did manage to weave in elements of the Parsifal legend. And Parsifal, dear readers, is definitely part of the Arthurian cycle. It’s not really part of “The Matter of Britain”, though, or at least not as strongly as other parts of the cycle. The earliest known retelling is Parzival by Wolfram von Eschenbach, a 13th-century German epic poem — of the Arthurian knight, Parzival, and his quest for the Holy Grail. Still, Thornspell was published in 2008, which does make it a relatively recent story to fall under the Arthurian influence. Debbie, I’m glad you’ve been enjoying them. I have always loved the Arthurian legends & all their permutations, so it’s been fun to reflect on them more deeply. I hope have one more post coming tomorrow—although I may just have to post on my series becoming a “future treasure.” Thank you for drawing the Black Gate post to my attention.